Everything will be heavily tied to your garrison in the new Warlords of Draenor expansion, and professions are no exception, you can't craft anything without your garrison. Below you will find explanation for the most important changes to the crafting system. You can craft most new recipe from skill one. (skill requirements for old recipes remain unchanged) This is probably the biggest change, because you no longer have to spend thousands of gold to level your profession skill up. Your skill level now determines how many resource you get from doing your daily profession cooldown. There are some recipes for inscription and engineering that still requires 600 skill. Work orders and profession daily cooldowns convert raw materials like herbs and ores to a more useful reagent. 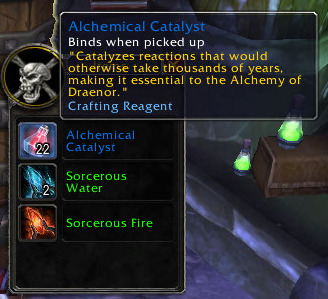 Almost every new high level item you can craft requires this reagent generated from doing work orders, or your profession daily cooldwon, these reagents binds on pickup (except enchanting and alchemy). You can get up to 20 reageants a day when you complete your daily cooldown. The number of reagents you get is based on your profession skill. You will only get 8 between profession skill 1 and 599, but from 600, it will lineary increase to 20 when you reach 700. There is also one extra perk at 700. Your daily cooldown can be performed three times in a row, but each charge takes 24 hour to recover. This just means you don't have to log in every single day to do your daily cooldown, once every 3 days is enough. You can build small profession buildings at your garrison and then craft items with a help of an NPC (maximum 3 at level 100). These building have 3 levels, and you can't craft most epic items until you level your building to level 3 (requires level 100, and Working More Orders achievement). And of course you can't craft everything, the highest level consumables, most weapon enchants, and the items that let's you upgrade your weapons and armors are only craftable if you also have the profession.